Home / Technology / Does Laser TV hurt Eyes? Does laser TV use laser light source, will it hurt your eyes?! To understand this truth, we can draw two aspects. First, look at the design of the laser TV itself, and then analyze the safety standards of the laser itself. As you can see, laser TV’s laser is in the machine. It is not a laser that is projected onto the curtain, but the fluorescence after the color separation of the color wheel; the fluorescence is projected onto the curtain, and the human eye sees the light after the screen is diffuse. Although all manufacturers are trying to improve the efficiency of light projection, but after 1~2 color wheel, and through prisms and lenses, the light has inevitably weakened a lot. General laser TV special screen gain is about 0.8, so the total intensity of the light to the human eye is lower than the 80% of the light source. Besides, the light is scattered through the 100 inch screen, and the effect on the human eye is very weak. If the light is strong, then the projection lens is relatively strong, because the area of the lens is very small and the intensity of the unit light is large. But laser TV is usually equipped with infrared sensing function. When people come near, they will immediately reduce the light and avoid shooting into the human eye. Is the laser source of laser TV safe within itself? First, look at the international and national standard classification of lasers. I This level of light is not visible and energy is low. It is not considered dangerous. II The class is classified as 400 to 710 nm visible light laser, and it is dangerous to observe the beam for a long time. The power is not more than 1mW, and usually the direct shoot of the 0.25s does not hurt the human eye. Generally, this kind can protect the long time from the injury by the eye’s disgust response (blink). IIIa Although radiation levels are also seen, there are dangers in both chronic and transient laser observations. Using optical instruments to directly observe lasers is also very dangerous. The power is 5 times of the II class, that is, not more than 5mW, and can protect the eye from injury by the eye’s disgust response (blink), and this kind of laser is not harmful to the human eye after diffuse reflection. IIIb Even in a flash, direct laser radiation can cause danger to the skin or eyes. Such laser power can reach 500mW, that is, 500 times the II laser. It can not be used for civilian use, and must take protective measures to operate. IV The power is more than 500mW, and even for a moment, the laser is dangerous to the skin or eyes, and its diffuse reflection can also harm the skin and eyes. f from the eye from the light reaction, the damage caused by light of different wavelengths is different, only the light of 400~1400nm can go to the retina, and the other wavelengths will be refracted out of the eye in the lens of the pupil, that is, invisible. But even if it is invisible, the power will damage the eyes, that is, the thermal effect is the same as scalding. At present, the laser source used in the laser TV is in the Class II, which belongs to the relatively safe light source. 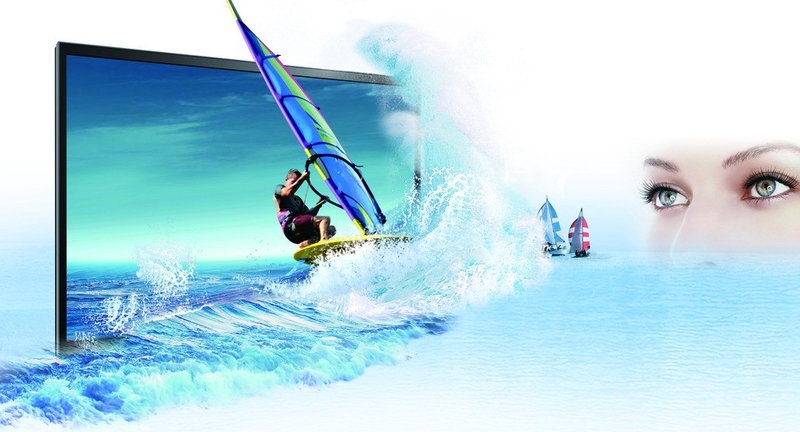 In fact, the common liquid crystal panel also uses polarized light, its light source is also the white light of blue LED and yellow phosphor, the LCD screen and the laser projection screen, in the optical view, there is no difference, because the light source of the laser TV has been fluorescent in the projector. The image of laser projection is diffused reflected light. Compared with the polarized light of LCD screen, the laser source’s picture is more suitable for long time viewing. In addition, the distance is far away from the picture. In fact, in view of human eyes, it is safer to see the picture projected by laser. I hope these will help you to buy a laser TV. More information please read the following article: Best Laser TV 2018 – Buyer’s Guide. Previous post: What is the Suitable Distance to Watch Laser TV?